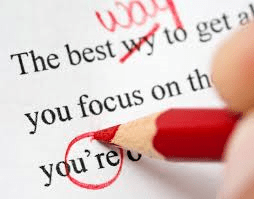 Grammar or spelling mistakes in submissions to agents or publishers are an obvious no-no. In this very tough publishing climate, it’s foolish to give people any extra reason to toss your work onto the reject pile. That said, proof-reading fiction is different from working on non-fiction. An author’s unique voice may involve the use of unusual grammar and punctuation, especially in dialogue. 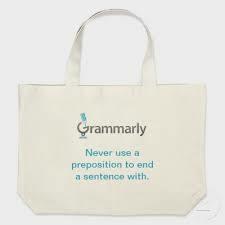 Yes, you can occasionally start a sentence with and or but. You can use colloquialisms. You can use incomplete sentences. But you need to be sure of the rules before you can sensibly decide to break them. It’s often more effective to wait a while between writing and proof-reading, to get some space between you and the words. Some people prefer to work on a hard-copy, rather than on the screen. Some people work on chapters in random order, or backwards or in different fonts – anything to distance themselves from the broader narrative and help them focus purely on the text. Work slowly in a quiet place where distractions are at a minimum and pretend you’re reading for the first time. Watch out for passive voice (was, had, would, have etc.) and over-used words like just, very, seem, felt, well and ‘ly adverbs. Keep punctuation simple, and try not to use exclamation marks! 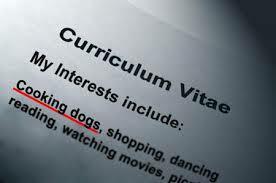 If you need extra help, proofreading programs like Grammarly can be useful. Grammarly is accurate, easy to use and best of all offers fascinating feedback. It gives detailed explanations of the grammar rule that has been broken, examples of correct and incorrect sentences, and offers corrections. Enlisting the help of other readers is also a good idea – a fresh perspective can work wonders, especially if your work has gone through several rewrites. Do whatever works for you, but never underestimate the vital importance of this final step. This entry was posted in Books, Writing and tagged Grammar, Grammarly, Passive voice, Proof-reading fiction, Proof-reading Programs, Proof-reading Submissions, Proofreading, Writers Resources by jenniferscoullar. Bookmark the permalink. Great post Jennifer. I’ve heard of Grammarly but never used it. Nice to know it works. So important, Jennifer – thanks for airing this issue so clearly. All your suggestions are spot-on. Reading aloud, or having someone read the submission and ms aloud to you, are also excellent ways of picking up issues you might otherwise overlook in your own work. I’d also recommend proofreading both on screen (where coloured wiggly lines alert you to possible problems) and also on hard copy, where errors that have slipped past can leap out. Time invested in doing these things could well make the difference between rejection and a contract to publish. Great advice Desney … thanks!